This is part 3 of the series on Troubleshooting Email Alerts in SharePoint and you may want to review part one. This section is dedicated to problems where your are getting the emails you expect but they are incorrect in some way. Right now I have a situation that is really annoying and I can’t find a reason for the cause. In a document library you can choose to upload a document, when you go to upload it, it will pre-select an Identifier as Answer-Draft and will populate the Comment section with what was originally entered months ago. Even if I change the Excel name on my computer and try to upload it as a different name the problem continues (even after deleting old copies in the library and after the recycle bin is emptied). The worst effect this has is on the alerts..when you get your email alert it will ALWAYS display the original file name. This is confusing some users and I really don’t know how to proceed. This problem does not occur when I upload a different Excel file, just seems to happen to certain ones that have some xml customization but I can not put the pieces together how one could affect the other. If anyone can help, please post a reply. p.s. I didn’t see an upload option here but have screenshots. @Ben – sounds very strange and not sure where to start but the problem seems with the upload and not the alert (as old info is being put into the record). We have had a couple cases where a user is out of the office, when suddenly people start getting messages about changes that the user “has made”, even though they are not logged in and making changes. Also, the users report getting large numbers of alerts. With one particular user, this occurred back when we were running MOSS 2007 and now as we are running SP 2010 SP 2. Are there any tips on tracking alerts going off when they are not expected, or large numbers of alert emails? 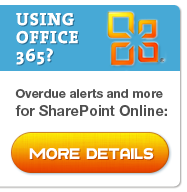 We’re using SharePoint 2010 to create request forms that are completed by team members, and the recipient of each form clicks on “Alert Me” to have notification emails generated when anything changes on the form. When someone does make an edit to an existing form and saves the form, an email is sent to the individual who set the individual alert, and that person can typically see at a glance what field was changed on the form because the word “Edited” appears next to that field. The challenge we’re having is that sometimes an update is made, and the alert email is generated, but you can’t tell what was changed on the form. “Edited” doesn’t show up anywhere in the email. This only happens intermittently, and we’re not sure why and how to always have the alert email show “Edited” next to all of the fields that were updated/changed on an existing form. If any knows why this is happening and how to resolve the issue, please post a reply.